The theme that’s applied to your PowerPoint 2013 presentation determines the basic look of the presentation’s text. However, you’ll often want to change that look, sometimes subtly and sometimes dramatically. You can control the most commonly used font settings by using the Font group in the Home tab on the Ribbon. To format existing text, highlight the text that you want to format. Then, click the toolbar button or use the keyboard shortcut for the format that you want. For example, to make existing text bold, highlight it and then click the Bold button or press Ctrl+B. To type new text using a fancy format, click the toolbar button or use the keyboard shortcut for the format. Then, type away. The text that you type is given the format you selected. To return to normal formatting, click the button or use the keyboard shortcut again. Or press Ctrl+spacebar. Whether text is difficult to read or you simply want to draw attention to it, you can make part of the text bigger than the surrounding text. The easiest way to change the size of your text is to use the Font Size drop-down list that appears next to the font name in the Font group on the Home tab. Just choose among the sizes that appear in the Font Size drop-down list or click in the Font Size box and type whatever size you want to use. You can also change the size of your text by using the Increase Font Size or Decrease Font Size buttons, or by using the Ctrl+Shift+> or Ctrl+Shift+< keyboard shortcuts. These commands increase or decrease the font size in steps, respectively. If you type more text than will fit in a text placeholder, PowerPoint will automatically make your text smaller so that the text will fit within the placeholder. If you don’t like the looks of a text font, you can switch easily to a different font. To change the font for existing text, select the text. Then click the arrow next to the Font control (found in the Font group of the Home tab) and choose the font that you want to use. If you’re allergic to the mouse, you can get to the font list by pressing Ctrl+Shift+F. Then you can use the up- or down-arrow keys to choose the font you want to use. Although you can change the font from the Font dialog box, the Font control on the Ribbon has one major advantage over the Font dialog box: It displays each of your fonts by using the font itself, so you can see what each font looks like before you apply it to your text. 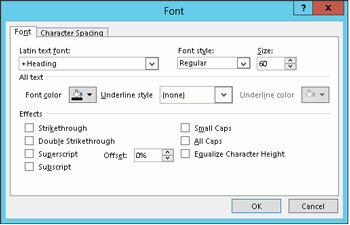 In contrast, the Font dialog box displays the name of each font by using the standard Windows system font. If you want to change the font for all the slides in your presentation, switch to Slide Master View and then change the font. PowerPoint automatically moves the fonts that you use the most to the head of the font list. This feature makes picking your favorite font even easier. Don’t overdo it with fonts! Just because you have many different font choices doesn’t mean that you should try to use them all on the same slide. Don’t mix more than two or three typefaces on a slide, and use fonts consistently throughout the presentation. If you want to set a font that is used consistently throughout a presentation, the best way to do so is to set the font for the presentation’s theme. Color is an excellent way to draw attention to text in a slide. To change text color, first select the text whose color you want to change. Then click the Font Color button and choose the color that you want to use from the color menu that appears. If you want to change the text color for your entire presentation, do so in the Slide Master View. Adding a shadow behind your text can make the text stand out against its background, which makes the entire slide easier to read. For that reason, many of the templates supplied with PowerPoint use shadows. You can apply a shadow to any text by first selecting the text and then clicking the Text Shadow button, found in the Font section of the Home tab. If you want all the text on a slide to be shadowed, however, you should use the Slide Master View to create the shadow format.